Shoeniverse: The Mother's Day Prep Post (plus WIN a Beautiful Bouquet)! The Mother's Day Prep Post (plus WIN a Beautiful Bouquet)! I realise of course that for our friends in the USA that Mothering Sunday does NOT fall on March 15th as it does here in the UK, however for our UK readers what better way to say 'I love you' to your Mum (or to grab as a gift for your children to give to your lady) than a beautiful bouquet of fresh flowers? There's also a regular competition to win flowers too (see bottom of this post). You can view all of the special Mother's Day offers by hitting the image above, or for my own personal picks see below. I love all kinds of flowers, and Clare Florist do a fantastic selection with something for everyone. This radiant Mother's Day Bouquet has been especially designed for your magnificent Mum by our expert florists, making it one of our perfect bouquets for Mother's Day flower delivery - comprising of elegant pink roses and germini, pretty Pink alstroemeria and gorgeous, long lasting chrysanthemums; delicately encased in luxury florists wrap and perfectly presented in a stunning hand-tied bouquet. Show your mum how special she is by presenting her with the Mother's Day Bouquet - A beautiful bouquet for only £32.99 including standard delivery to any address in the UK! Have these flowers delivered 6 days a week throughout the UK. Your flowers will be delivered in our special delivery box to prevent damage while in transit, so they arrive in excellent condition all for just £32.99! For that extra special personal touch, why not a second box of delicious Thorntons Chocolates an adorable teddy to accompany your beautiful fresh hand-tied Mother's Day Bouquet bouquet. From our fresh Variety Flowers range we are pleased to bring you... Burst of Spring. Fresh and vibrant, this eye catching flower bouquet is bursting with seasonal colours and will brighten up any home or office making a striking gift that anyone would be happy to receive. The Burst of Spring includes fabulous bright gerbera , scented lilies, pink roses and long lasting santini, amongst many other colourful flowers. Send this lovely bouquet selected and arranged by our expert florists then gift wrapped to show that special person how much you love them. Have these flowers delivered 7 days a week throughout the UK. Your flowers will be delivered in our special delivery box to prevent damage while in transit, so they arrive in excellent condition all for just £29.99! For that extra special personal touch, why not add a Handwritten Greetings Card or an adorable teddy to accompany your beautiful fresh hand-tied Burst of Spring bouquet. Red and yellow and pink and green...you'll find all of the colours of the rainbow in this fantastic bouquet of finest quality mixed roses. 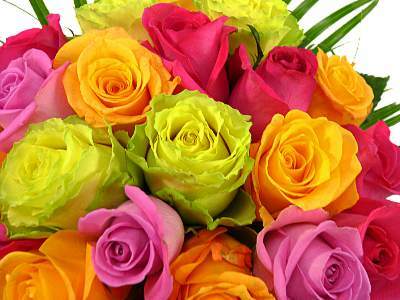 Hand-selected by our expert florists and tastefully arranged, these wonderful Rainbow Roses are sure to please! Rainbow Roses are a firm favourite - with their classic colours and simply elegant hand-tied design, they make a superb gift. With a name like Rainbow Roses, it's no surprise that it's the colours which make this bouquet so extraordinary. The brightness of those reds! The vibrancy of those yellows, so bright you'd think they would light up the room at night. This kaleidoscope dream of colours makes this the perfect bouquet to buy someone for a cheerful, celebratory occasion; a birthday, a party, or just to put a massive smile on their face. Looking for something more extravagant? Make sure to check out our 100 Rainbow Roses Bouquet, featuring a stunning collection of 100 roses in deep shades of pinks, yellows, reds and oranges. 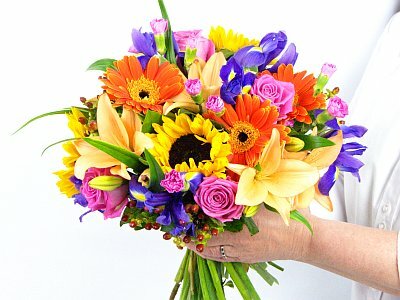 This bouquet is a fantastic gift for those extra special occasions or when you want to make a BIG impression! The roses are selected and arranged by our expert florists, then tastefully gift wrapped, with delivery 6 days a week throughout the UK. Your flowers will be delivered in our special delivery box to prevent damage while in transit, so they arrive in excellent condition all for just £29.99! For that extra special personal touch, why not add a yummy box of Thorntons Chocolates, a Handwritten Greetings Card, a chic glass vase or an adorable teddy to accompany your beautiful fresh hand-tied Rainbow Roses bouquet. 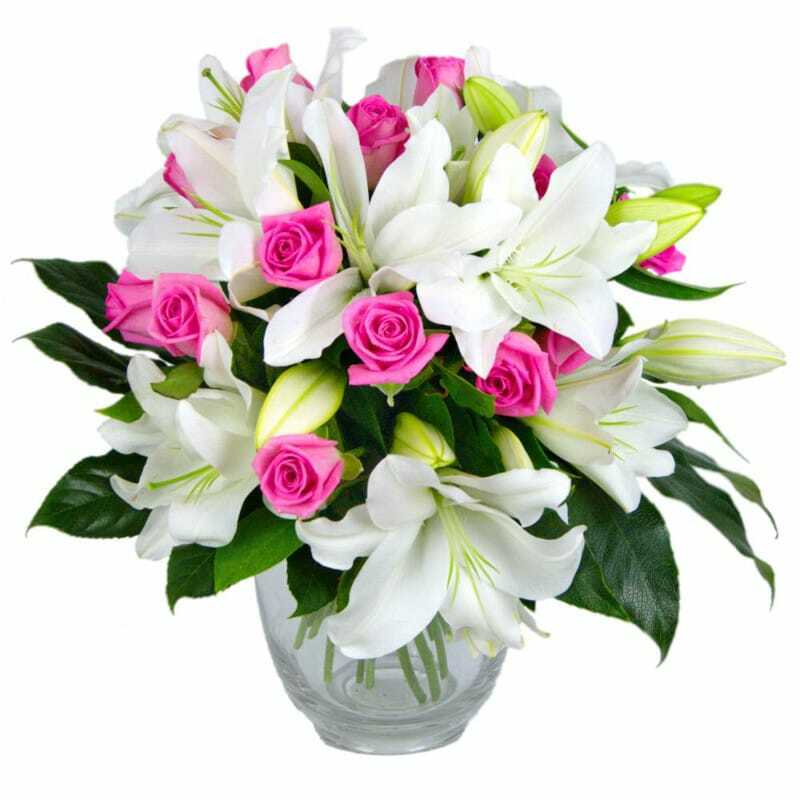 Part of our stunning Romantic Flowers range we bring you the stunning Rose and Lily Bouquet bouquet. The Rose and Lily Bouquet hand-tied bouquet is an elegant collection of lustrous pink roses intermingled with crisp fresh white lilies, embraced with lush green foliage and encased in luxury florist wrap, using only the freshest and most vibrant flowers this bouquet will help to set the mood for any romantic occasion. 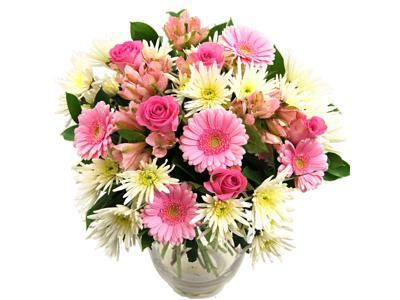 Send this lovely bouquet which is selected and arranged by our expert florists then gift wrapped to show that special person how much you love them. Have these flowers delivered 6 days a week throughout the UK. Your flowers will be delivered in our special delivery box to prevent damage while in transit, so they arrive in excellent condition all for just £38.99! For that extra special personal touch a delicious box of Thorntons Chocolates or a chic glass vase your beautiful fresh hand-tied Rose and Lily Bouquet bouquet. Our Springtime Daze bouquet is a fitting arrangement to bring those lovely smells of the blooming springtime flowers inside. 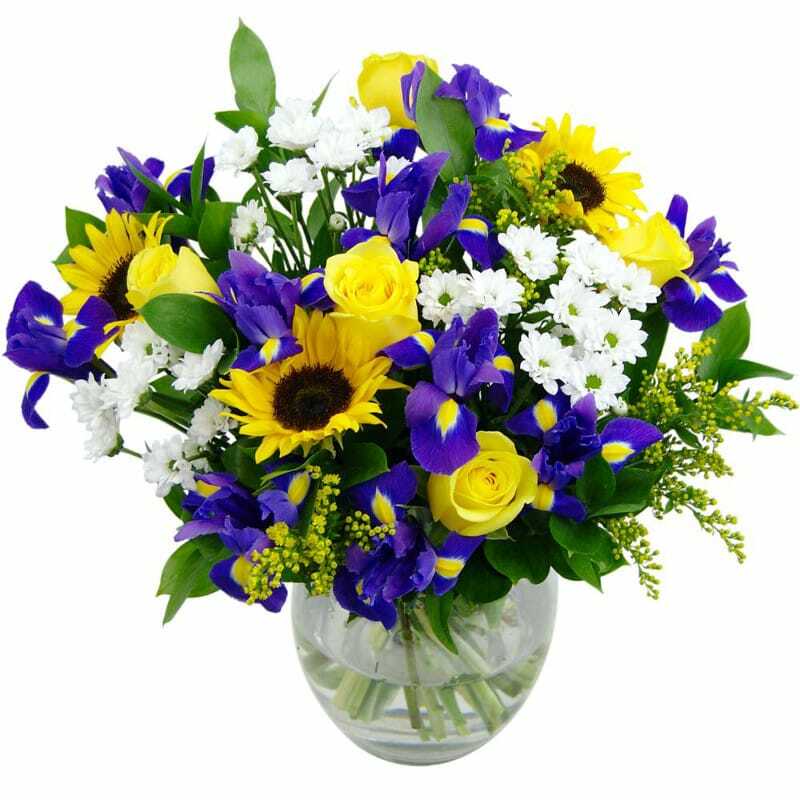 With crisp blue iris, Sunflowers, roses and white chrysanthemums this beautiful spring time bouquet will look and smell amazing placed in any setting around the home or office. Your fresh Springtime Daze can be delivered 7 days a week throughout the UK in our special delivery box to prevent damage while in transit, so they arrive in excellent condition all for just £34.99! For that extra special personal touch, why not add a Handwritten Greetings Card, a delicious box of Thorntons Chocolates, a chic glass vase or an adorable teddy to accompany your beautiful fresh hand-tied Springtime Daze bouquet. So those were my top picks from the Clare Florist website here in the UK. Which one is your favourite? Do you like to give flowers on Mother's Day, or do you prefer other gifts? Shoeniverse (although called ShoeTurn back then) was born on March 3rd 2012 over on Tumblr. Eventually we moved to Blogger (with a new name and URL) on June 24th 2012. Follow Shoeniverse's board www.Shoeniverse.info on Pinterest. Fashion and style blogger, interested in all things girlie and pamper or shopping related. “The Bachelorette” Episode 2 Recap: Who Has A Secret Girlfriend?